YOUR FAVORITE SURVIVOR IS BACK! Fully equipped with his trusty Jetpack… Take control of Bear Grylls as he rockets through the AIR and avoids rocky obstacles! Bear Grylls, Winner! Best Lead Character - 148apps.com 2013 Best App Ever Awards! Air Bear Grylls is the most addictive one touch obstacle avoidance game in the App Store today! Free to Play and NO In-App Purchases. High quality graphics, smooth gameplay and the most EPIC character you could ask for. Can you help Bear Grylls in his latest and greatest High Flying Adventure? Parfois, il faut COURIR pour survivre ! Dans Survival Run avec Bear Grylls, développé par F84 Games, vous devez courir pour survivre et échapper au grizzly le plus implacable qui soit. Traversez divers environnements pour gagner des pièces et des larves dorées tandis que vous mettez vos nerfs à rude épreuve. Dans Survival Run, les menaces se tapissent dans le moindre recoin ! * Incarnez Bear Grylls, votre aventurier et expert en survie préféré. * Débloquez des personnages Bear Grylls exceptionnels. * Base jump, hélicoptères de sauvetage, parapente et bien plus encore ! Scènes rares / légères de violence (animation ou fantastique). Simulations rares / légères de jeu de hasard. The Bear Essentials is the ultimate, hands-on survival tool from the ultimate survivor. Intimately presented by the man himself, this info in this app is tested and proven in the wild and may well help save your life in an emergency. A complete blend of survival hands-on advice, interactive instruction manual, wilderness quiz, mini-games and adventure photo gallery, all rolled into one. Bear's taken all his survival training and know-how from the British Special Forces, Everest, the French Foreign Legion, Scouts and countless expeditions into the wild, and distilled them down into this one easy-to-use app. Find out Bear's personal tips and 'tricks of the trade' as you enter his equipment room to share one-on-one his survival skills and experience. Have you got the skills to survive in the wild? You have now! In this multimedia app packed with exclusive film, photos, illustrations, step-through-guides, mini-games, quizzes, quotes and interactive tools, Bear Grylls takes you through his personal essential guide to survival in the wild. It's got something for everyone - whether you're an aspiring young explorer, Scout or seasoned adventurer - enter the world of extreme survival - Bear style! There's everything you need to know from packing the right equipment, preparing yourself mentally and physically through Bear's own fitness program, to learning how to navigate, observe, track, snare and trap wild animals. Learn the basics for using tools and knives in the field as well as administer emergency first aid. Find out how to set up shelter, make fire, tie knots and find water - with the ‘bear’ minimum. Bear's also developed some exclusive tools for the app including a unique 'survival' mode, compass, watch and torch taking full advantage of iPhone/iTouch features. 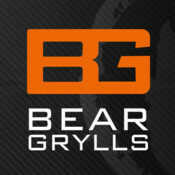 Please note that Bear Grylls Bear Essentials is designed to operate on iOS4 only. Some features will operate on an iPhone 4 only. • 18 individual chapters detailing Bear's advice on the most important survival skills. • Over 40 exclusive films of Bear talking about his top survival tips and experiences. • 35 exclusive instructional illustrations and interactive features to help learn the key survival techniques. • 3 interactive mini-games to perfect your survival skills. • 30 of Bear's favourite inspirational quotes. • Bear's fitness regime and top music training tracks uncovered. • Bear Grylls exclusive Survival Mode tool. • Bear’s top 10 knots. 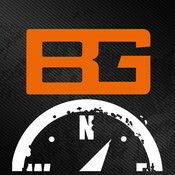 • Gyro observation game (available on iPhone 4 only). 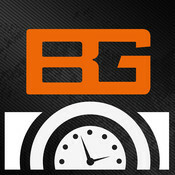 Look out for great new updates to this app with additional features and new games added regularly. Scènes rares / légères de violence réaliste. Compatibilité : Nécessite iOS 4.0 ou une version ultérieure. Compatible avec l’iPhone, l’iPad et l’iPod touch. Disasters can strike at any time and in any place. So, before you go into the wild, whether on a hike, expedition or just a bike ride, be prepared for an emergency. This very clever, very simple app allows you to pre-program your key contacts, vital statistics, as well as the local search and rescue numbers, so that in the case of an emergency, you can hit the SOS button and your precise GPS position and distress call will be relayed. This app, when initiated in SOS mode, will instantly alert your pre-programmed contacts and emergency services that you are in urgent need of assistance. 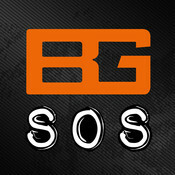 WARNING: The SOS feature should only be used in a real life emergency. Network coverage required. Hoax, emergency call-outs cost lives. This app also includes personal videos with Bear Grylls on the key 'priorities of Survival', and what 'first-steps' you need to take in case you find yourself stranded. 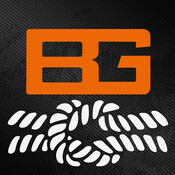 The ultimate Knot app from the ultimate adventurer: Bear Grylls. This app shows Bear's favourite knots for almost every eventuality. In simple, easy to learn diagrams and videos, Bear takes you through the top knots that he uses for his many adventures and beyond. This is designed to give you the simplest most practical knots to help you be able to do everything from lashing together a raft, lowering a casualty off a mountain, to more every day situations like making sure the roof rack is tied down securely! Have this app on your phone and you will never be left scratching your head wondering how do I fasten this stuff down drum tight, or tie guy-ropes to a tent peg so they won't slip. Nobody wants complicated or hard to learn knots - we all just want to know a few clever, simple ones that are effective and everyday practical. Here is just that app… and one-day it just could save your life. Page crée le 05 08 2011 par clementp. Derniere modification fait le 05 03 2014.